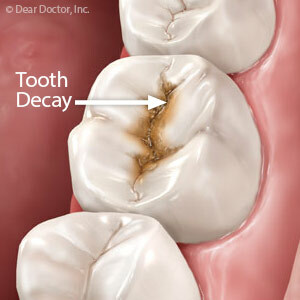 Tooth decay doesn’t suddenly appear out of the blue. Cavities and other damage are the result of a long process that begins with bacteria living in a thin biofilm on tooth surfaces known as plaque. These bacteria thrive on sugars from leftover food in your mouth and then produce acid as a waste product. Chronic high levels of acid cause your enamel, the protective layer of your teeth, to soften and erode. While there are treatment options at each stage of decay — including crowning or even tooth replacement — the best approach is to try to prevent plaque buildup that supports disease-causing bacteria. Here are 3 of the best ways you can do that. Brush and floss daily. It usually takes 12-24 hours for enough plaque buildup to support bacteria. By brushing and flossing at least once a day, you can remove most of this buildup, with twice a year dental cleanings to remove hard to reach plaque you may have missed. Be sure to use fluoride toothpaste to help strengthen enamel against high acid. And wait a half hour to an hour after eating before brushing to give saliva time to reduce the acid level in your mouth. Cut back on sweets. You’re not the only one who loves sugary snack foods — so do oral bacteria. The more sugar and other carbohydrates they feast on, the more they produce acid. The best approach is to cut out sugar-rich snacks altogether and instead snack on fresh fruits, raw vegetables or dairy products. Limit sweet treats to meal times. Use decay-fighting supplements. Your mouth and hygiene efforts may need a little assistance, especially if you have low saliva flow. You can boost this with an artificial saliva supplement as well as with products containing xylitol, an alcohol-based sugar. Xylitol also has an added benefit in the fight against decay because it inhibits bacterial growth. And be sure to talk with us first before taking any dental supplement.